♦ Have a Wiener with Dr. Weener! 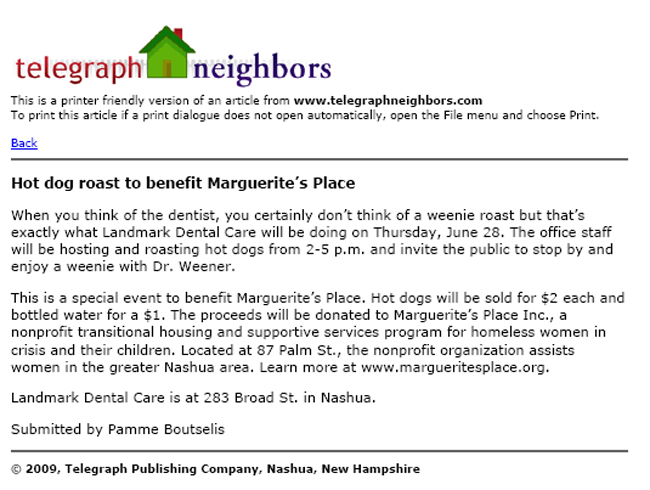 All proceeds donated to Marguerite's Place of Nashua. To find about more about Landmark Dental Care's involvement in community events, please contact Katy at katy.w@landmarkdentalnashua.com. 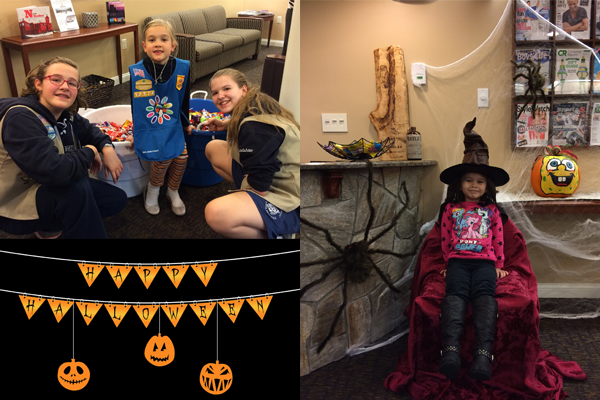 For the 2016 Halloween, Landmark Dental Care celebrated in wizardly style, inviting patients, friends and family to stop by in costume for a Harry Potter themed Halloween. At our annual Halloween Candy Buy-Back, we collected 283 lbs of candy. 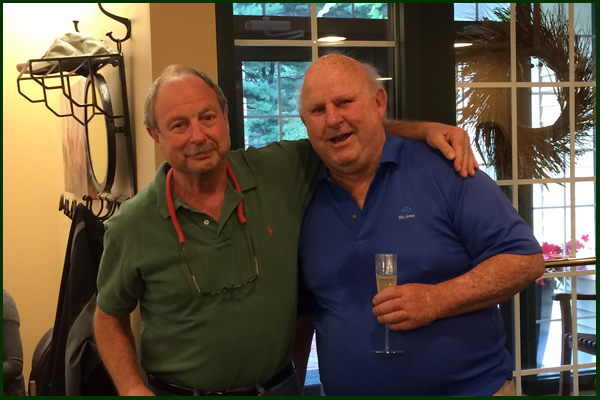 A special thanks to Troop 10203 and to everyone who came by to celebrate with us! 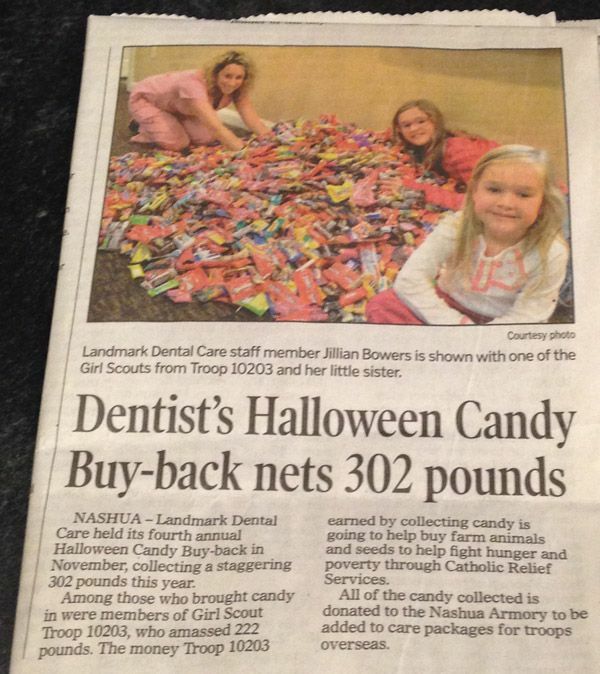 In November 2014, Landmark Dental Care collected over 302lbs of candy for our annual Halloween Candy Buy-Back. Thanks to Troop 10203! To read the full article, click here. 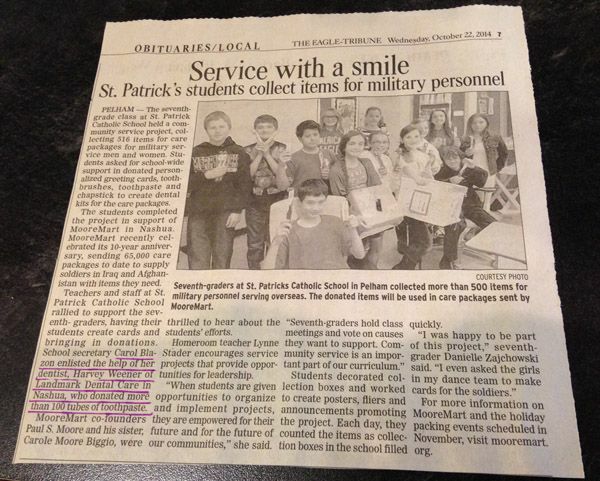 In October 2014 Landmark Dental Care donated more than 100 tubes of toothpaste to help support the seventh grade class at St. Patrick Catholic School. 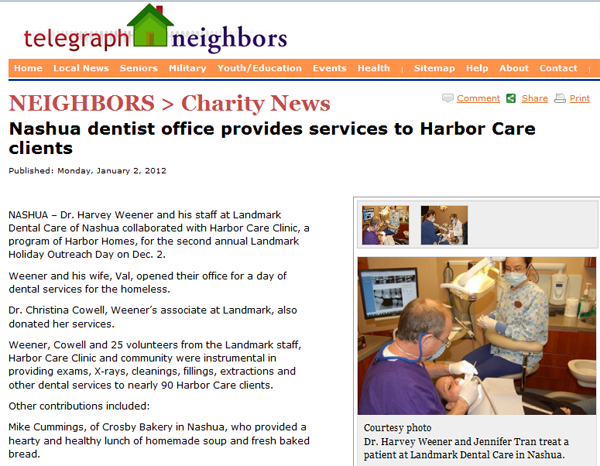 Dr. Harvey Weener and his staff at Landmark Dental Care of Nashua collaborated with Harbor Care Clinic, a program of Harbor Homes, Inc. for the second annual "Landmark Holiday Outreach Day" on December 2, 2011. Dr. Weener and his wife, Val, generously opened their hearts and their office facility for a day of dental services for the homeless. Dr. Christina Cowell, Dr. Weener's associate at Landmark Dental Care, also donated her services to this day of giving and community commitment. Dr. Weener, Dr. Cowell and twenty five volunteers from the Landmark staff, Harbor Care Clinic and the community were instrumental in providing exams, xrays, cleanings, fillings, extractions and other miscellaneous dental services throughout the day to nearly ninety clients of Harbor Care. - Mike Cummings of Crosby Bakery in Nashua who provided a hearty and healthy lunch of homemade soup and fresh baked bread. A special "Thank You" to the members of Dr Weener's staff, several other committed dental professionals and patients who donated much needed clothing and blankets for this Special Day of Caring. Landmark Dental Care awarded the first annual Arthur Comolli Scholarship for the New Hampshire Technical Institute in April 2011 in Nashua, NH. Landmark Dental Care is a proud sponsor of Dentistry from the Heart. 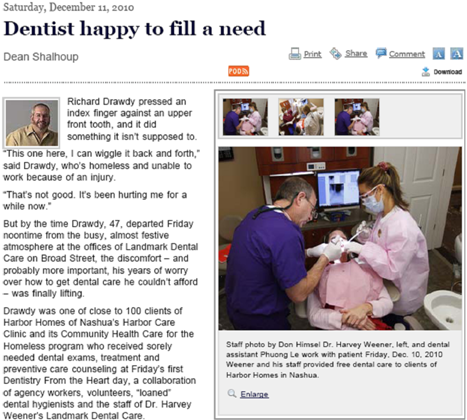 Landmark Dental Care participated in the first Dentistry from the Heart day in Nashua, NH on December 10, 2010. To learn more about this special event, please click on the article below.